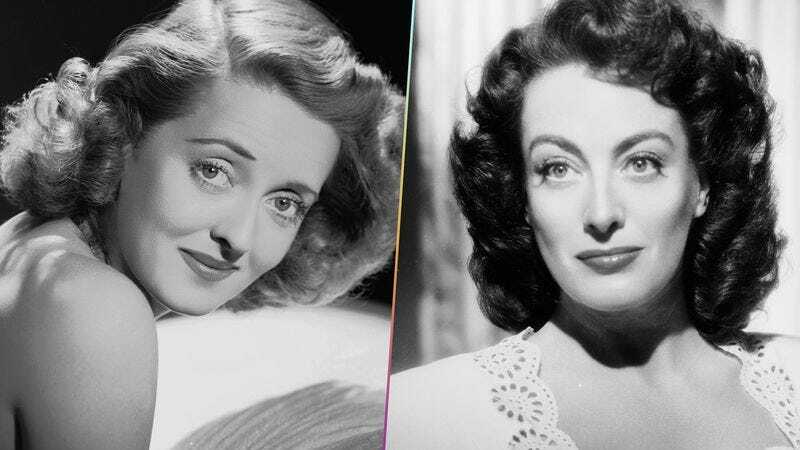 Ryan Murphy’s Feud: Bette And Joan kicks off on Sunday, March 5, and is an intimate and intricate examination of the relationship between the two undisputed movie queens of Hollywood’s Golden Age: Joan Crawford and Bette Davis. The two were in competition for parts for years until finally co-starring in the 1962 gothic film What Ever Happened To Baby Jane? ; Feud explores these complicated personalities coming together on the set of that movie. Murphy has sculpted an absolute love letter to the peak of Hollywood, with candy-colored sets belying the sinister forces afoot underneath to ensure that Bette and Joan remained at war. So Feud will be a fun and fascinating watch regardless. But if you’re unfamiliar with these screen queens and are daunted by their extremely long filmographies, where’s the best place to start? The A.V. Club is here to help with four of the finest representative films from each (and there are so many to choose from, including a few we’ve already covered in Watch This). We’ve added a few Oscar winners, a pair of makeover movies, and any number of love triangles and passionate murders. But any of these black-and-whites from the “women’s picture” era would make for engaging Sunday afternoon viewing, enhancing your enjoyment of that night’s Feud all the more. Before Scarlett O’Hara, there was Jezebel, with Bette Davis’ flirty, engaging Julie flouting conventions in the plantation-era South. Julie’s nose-thumbing eccentricities (she wears red to an all-white ball, which somehow translates even in black and white) lose her the man she loves (Henry Fonda), so she doubles down on efforts to get him back. When her self-centered machinations result in the death of an innocent, this Jezebel has to go to extreme lengths to possibly redeem herself. It was a perfect role for Davis’ fierceness and strength of spirit, resulting in her second Oscar. Her Julie can not only break from societal mores, but will even have your back at the yellow fever colony; she’s born with a tenacity that Scarlett took years to acquire. Joan Crawford was transitioning from showgirl into bona fide movie star when she starred in Susan And God, an unlikely tale of a breezy socialite who tries to get deep. The post-Depression world was full of glamorous social tales like this one, featuring people who wear evening clothes to dinner and use “winter” as a verb. Crawford’s Susan is one of them, until a newfound spirituality discovered on her tour of Europe results in her meddling of all her friends’ lives (including a barely recognizable Rita Hayworth). It isn’t until her estranged husband (Fredric March) puts his foot down that Susan turns some of that insight into her own life, as Crawford’s magnetism elevates what could have been a fairly rote tale. Here’s a Crawford take on the villain/victim switch, as she stars as a woman doomed to a life of crime after she’s scorned by society because of a disfiguring scar on her face. Her life changes when she meets a benevolent plastic surgeon (Melvyn Douglas), who she of course eventually falls for. Crawford is never campier than when she’s slapping around a pretty woman who makes fun of her, but if you’re going to make a movie called A Woman’s Face, there’s no better face to feature. Her many “post-surgery” closeups show how perfectly made for celluloid her symmetrical visage was. Her doctor says that he’s created a “monster with a beautiful face and no heart,” and we get to see Crawford wrestle with those two sides as she decides whether to push a small child into some treacherous rapids, for example. Only a few years after her Oscar, Crawford tackled another unglamorous role in a film that’s about as dark as noir gets. Here her caretaker Louise mentally unravels because of her obsession with her off-and-on lover David (Van Heflin). Crawford starts the film by walking the empty, bleak streets of L.A. in a daze, makeup-less: The story is told in flashback as we see very specifically how her mental state descends from besotted to jealous to illness. Crawford’s expressive closeups were never better, as she depicts each declining mental state in turn, punctuated by moody, sinister lighting. We know from the very beginning of the film that a tragic ending is in store, yet we can’t turn away from Crawford. Here’s Davis’ turn as the victim—like Crawford’s Mildred Pierce—is also at the hands of a young upstart. Joseph Mankiewicz’s Best Picture winner All About Eve used one of his favorite tricks (three alternating narrators) to tell the story of Broadway diva Margo Channing, who is nearly undone when obsessive young admirer Eve tries to take over her life. The witty, eminently quotable dialogue highlights a tale that delves into theater, the creative process, show-business friendships, even the challenges of being a post-ingenue actress: a story that Davis, in her 40s at the time, was only too familiar with, and effectively translates that struggle to the screen. Also notable: In this film Davis met her fourth and final husband Gary Merrill, who shows up in the first episode of Feud.